When managing Parkinson’s disease becomes too much to handle alone, think back to the legendary story of Muhammad Ali. Born in 1942, he won two Golden Gloves on the national level and six in Kentucky by the 1950s. After taking a short forced break because of his refusal to fight in the Vietnam War, he bounced back into the gym and participated in one of his most famous bouts ever: the Rumble in the Jungle. Though fans noticed him moving a little slower and struggling to speak toward the end of the 1970s, it wasn’t until 1984 that Ali was officially diagnosed with Parkinson’s disease. That announcement led to people all around the world trying to find out more about the disease and how it affected the body. We now know that Parkinson’s causes a number of symptoms such as impaired mobility and speech patterns. Despite struggling with these and other symptoms, Ali never stepped away from a challenge. He viewed the disease as just another competitor he would face. After going public with the disease, he received the Presidential Medal of Freedom, lit the torch at the opening ceremony for the 1996 Olympic games and returned to the Olympics again in 2012 to carry the Olympic Flag. 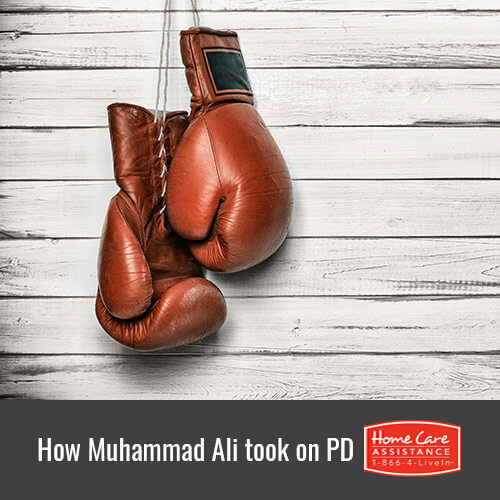 By remaining in the public eye, Ali proved to seniors and their Rhode Island caregivers that living a full life with PD is possible. Studies over the years found that boxers, football players and other athletes who receive frequent blows to the head are more likely to develop Parkinson’s than others. Ali presented those findings when he spoke in front of the U.S. Congress alongside actor Michael J. Fox to ask for more funding for Parkinson’s research. Nicknamed “The People’s Champion”, fans will remember Ali for both his incredible boxing career and for his ability to stay positive in the face of adversity. Give your loved one a chance to live gracefully with PD by calling Home Care Assistance in Rhode Island at (401) 284-0979 today. We are a leading home care provider that enables seniors to age in place while getting the help they need with daily tasks such as personal care, mobility assistance, meal preparation, and more. Customize a care plan with an experienced Care Manager today when you call.